242 pages | 4 B/W Illus. Rising life expectancies and declining social capital in the developed world mean that an increasing number of people are likely to experience some form of loneliness in their lifetimes than ever before. Narratives of Loneliness tackles some of the most pressing issues related to loneliness, showing that whilst recent policies on social integration, community building and volunteering may go some way to giving an illusion of not being alone, ultimately, they offer a rhetoric of togetherness that may be more seductive than ameliorative, as the condition and experience of loneliness is far more complex than commonly perceived. Containing thought-provoking contributions from researchers and commentators in several countries, this important work challenges us to rethink some of the burning issues of our day with specific reference to the causes and consequences of loneliness. Topics include the loneliness and mental health of military personnel, loneliness and social media, loneliness and sexuality, urban loneliness, and the experiences of transnational movement and adopted children. This book therefore makes an overdue multidisciplinary contribution to the emerging debate about how best to deal with loneliness in a world that combines greater and faster connectedness on the one hand with more intensely experienced isolation on the other. Since Émile Durkheim first claimed that the structure of society could have a strong bearing on psychological health in the 1890s, researchers in a range of disciplines have explored the probable impact of social context on mental health and wellbeing. 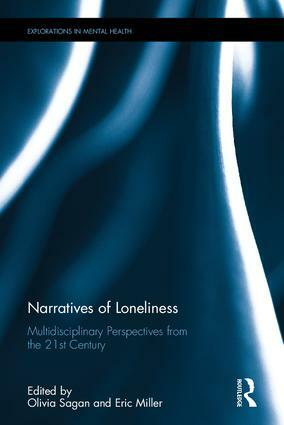 Interdisciplinary in approach, Narratives of Loneliness will therefore be of great interest to academics, postgraduate students and researchers in social sciences, the arts, psychology and psychiatry. Olivia Sagan is a Chartered Psychologist and Counsellor. She is Head of Division for Psychology and Sociology at Queen Margaret University, Edinburgh. Eric Miller is Associate Professor of Psychology at Kent State University, USA.